Menlo Park, CA, March 1, 2018 - WeVideo, the leading provider of video creation solutions for education, today announced the integration of WeVideo for Schools with two widely-used Learning Management Systems (LMS), Canvas and Schoology. Integration is available at no additional cost to paid WeVideo for Schools license-holders. Gretta Rogne, MEd., secondary instructional technology specialist at New Caney ISD, Texas, and an early user of WeVideo for Schools with Canvas said, "The ability to connect WeVideo directly into our Canvas environment has improved ease of access. Our teachers and students appreciate having direct access without having to redirect to another site, with an additional login. In our experience, the more programs we add to our Canvas environment, like WeVideo, the more usage we see in the program." Dr. Nathan Lang-Raad, chief education officer for WeVideo, said, "Digital learning in schools continues to evolve rapidly, and WeVideo is committed to empowering educators and students to use video creation for enhancing the entire learning experience. We've long partnered with cornerstone education platforms like Google Classroom and the addition of support for Canvas and Schoology is an important expansion of that presence. This further enhances WeVideo for Schools as a natural extension of the classroom and an integral part of the curriculum." Administrators and staff can manage individual access to WeVideo from within their LMS. Once signed into the LMS, no additional sign-in is required for teachers and students to access WeVideo, reducing complexity. Administrators can take full advantage of the LMS to manage access. LMS features such as grading and messaging can now be applied to WeVideo assignments. 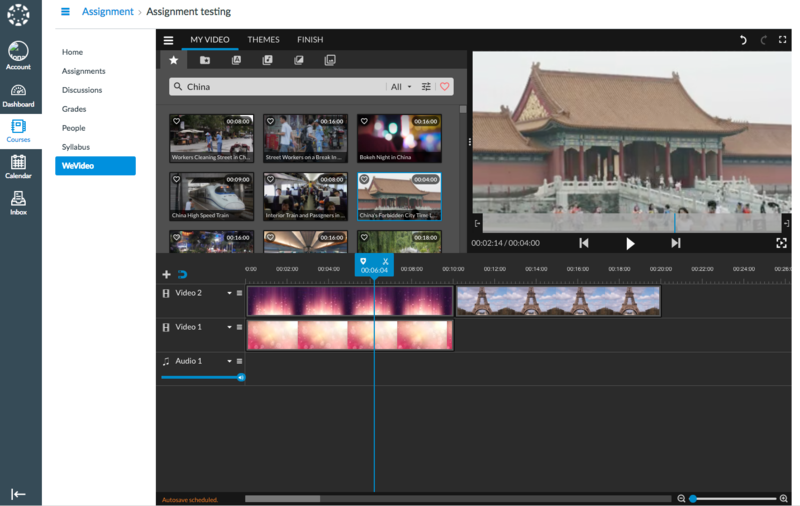 Teachers can easily assign WeVideo as part of the curriculum planning they already prepare within the LMS and manage assignments that utilize WeVideo by class, project, etc. 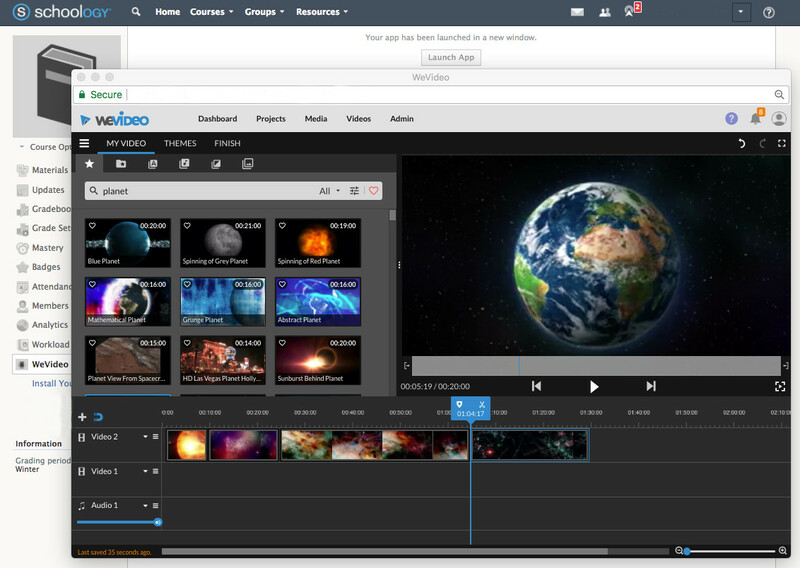 WeVideo is available to teachers and students as a tool within the LMS menu alongside other resources they access from within the LMS. This enables users to take full advantage of WeVideo without having to leave their LMS. Students can submit finished WeVideo assignments to teachers directly within WeVideo. Support for Canvas and Schoology is available now to WeVideo for Schools license-holders. WeVideo will facilitate the integration with the existing LMS, free of charge. For more information and to request WeVideo integration with Canvas or Schoology, contact the WeVideo for Schools support team. Schools and districts can now try the solution as part of WeVideo's no-cost structured pilot program. Schools that start a free, 90-day pilot program by March 15th, 2018 are eligible to save 25% on WeVideo for Schools when the school or district purchases 500 or more licenses by June 30, 2018. Visit here for details.